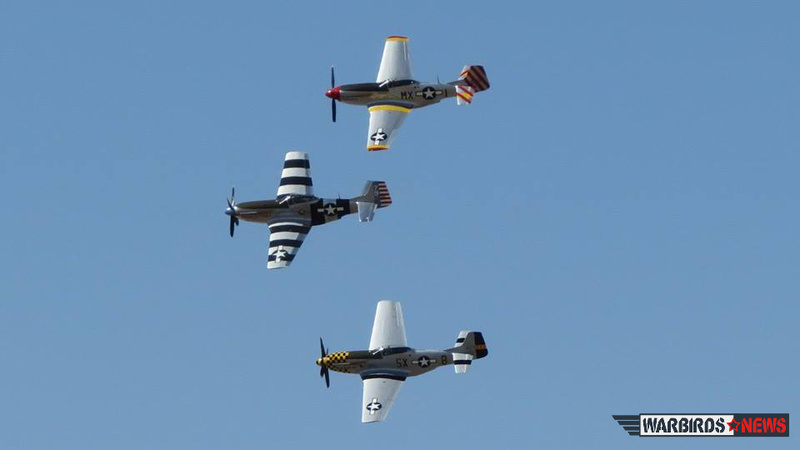 Elena DePree reports for WarbirdsNews from Luke AFB in Glendale, Arizona on their recent Open House air show. As Thursday, March 13th dawned bright and clear, the jet noise got louder, and propellers started to appear! I started out welcoming the Commemorative Air Force’s B-25J “Maid in the Shade”, B-17G “Sentimental Journey”, C-45, and C-47. Once they got parked, the jet noise got a little louder. A MiG-15 and T-33 were the first jets to arrive. Then an A-4 Skyhawk took a few minutes and did three go arounds, letting everyone know that he was just as loud as the resident F-16’s. The aircraft kept coming: a TBM Avenger, L-29 Delphin, two MV-22 Ospreys, two C-130Js, a C-17 and a KC-135 Stratotanker. Friday was Military Family Day, and they showed up in force. The performers went through their practice routine, and put on some spectacular displays. It all began with the Wings of Blue parachute demo team from the United States Air Force Academy. Next up were The Firebirds Delta Team, comprised of Matt Chapman, Jack Knutson, and Rob Holland in their high performance aerobatics aircraft. Then Doug Rozendaal put the CAF’s P-51C Red Tail Mustang through its paces with a stunning aerial routine. 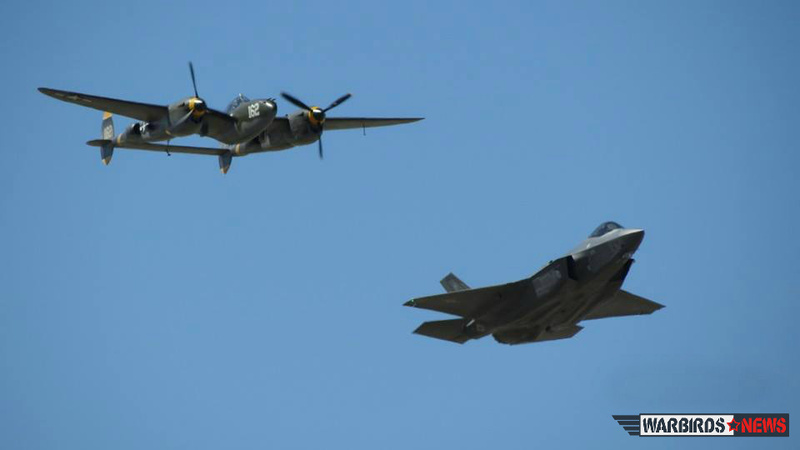 The F-35A Lightning II made one of its first public flying displays in formation with its P-38 Lightning namesake to much applause, and this was followed by the USMC Osprey demonstration, Matt Chapman’s solo routine in his Eagle 580, the Deer Valley CJ-6’s, two F-86 Sabres, a Viper F-16 racing against a Dodge Viper car, a close air support demonstration with the Marines and F-16’s, Rob Holland, the Bremont Horseman in their P-51 Mustangs, Michael Goulian, and the headliner USAF Thunderbirds. The order of performers remained the same over the weekend. We were told at the pilot briefing on Saturday morning that the expected crowd size was to be 194,000, but I honestly think that mark was surpassed! I worked the CAF’s B-17 and we had a line of visitors to go through the aircraft all day. The B-25 also had lines all day. Everywhere you looked; eyes were on the sky, kids were laughing, and there was much oohing and ahhing over all the flying airplanes. I also narrated the Red Tail acro act for Doug Rozendaal all three days. On Sunday, I was able to discuss the CAF a little bit, and also talk about a WWII veteran that visited our B-17. His name was Buford Pafford, and he was a crew chief on the B-17 “Knockout Dropper” which flew from Molesworth Air Base in England. 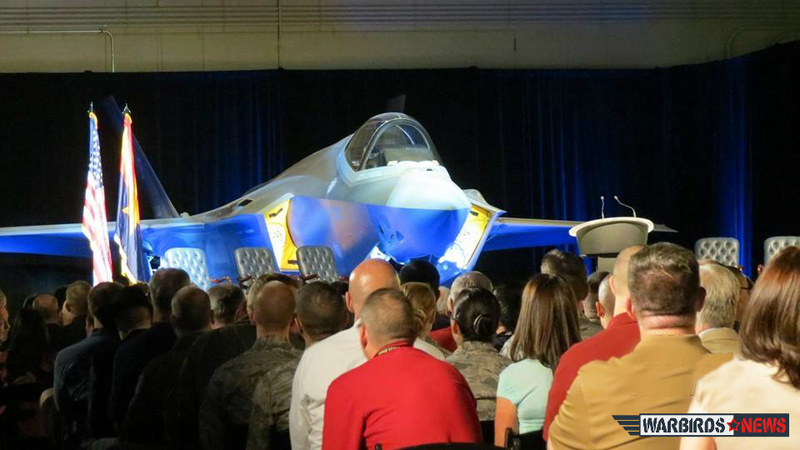 I also had the privilege of attending the unveiling ceremony of the first 56th Fighter Wing F-35A Lightning II on Friday morning. I have to say that the technology of this new jet will bring a whole new meaning to the term “American airpower.” The Heritage Flight was back on after being suspended in 2013 due to budget restrictions. 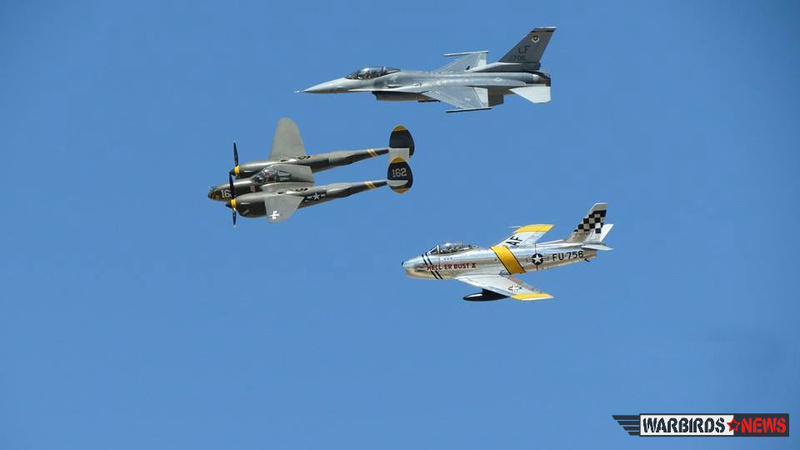 The P-38 Lightning, the F-86 Sabre, and the F-16 drew a huge response from the crowd with cheers and applause. 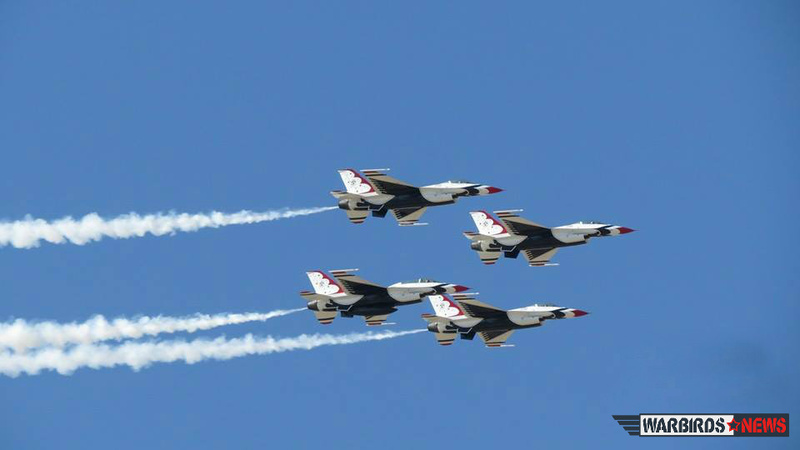 The icing on the cake was the USAF Thunderbirds. The crowd seemed to love the jets, even with the mini-sandstorm that blew in on Saturday afternoon, delaying the show by 35 minutes. I have to give huge kudos to the men and women at Luke AFB who made the show run so smoothly. The final crowd count on Sunday was a whopping 205, 000! 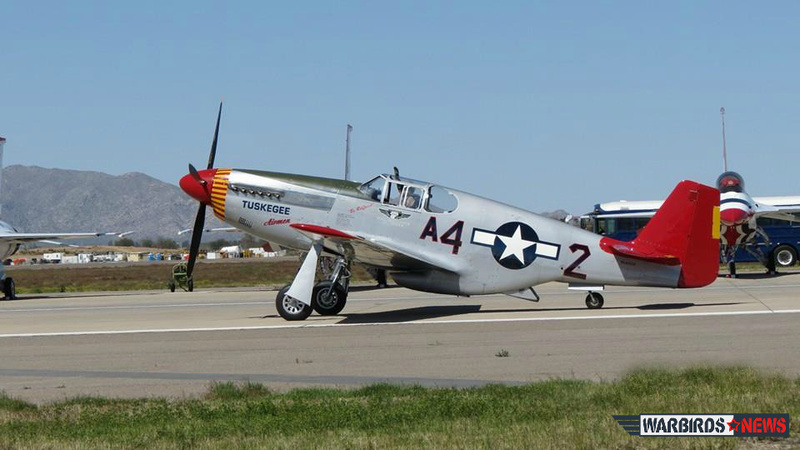 Way to go Luke Air Force Base – the air show season has started. Just wondering if the P-38 mentioned is “Glacier Girl”? It’s SKIDOO from Planes of Fame.